This is the view of the St. Augustine Lighthouse just about 100 feet from the front door of our house. I have been walking and driving by this very view for years but the other day it just caught my attention just right and I started the painting the next day. 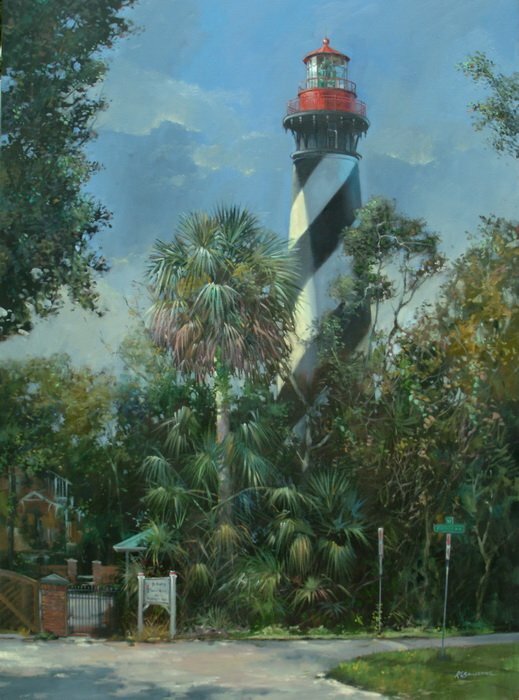 I have done many other paintings of this very lighthouse but this is the largest one. Notice the warm colors lit by the sun on the white stripes and the Cerulean Blue cast on that same strip with that portion of the stripe being lit by the sky. Those changes in color temperature helps to give the lighthouse its round form.